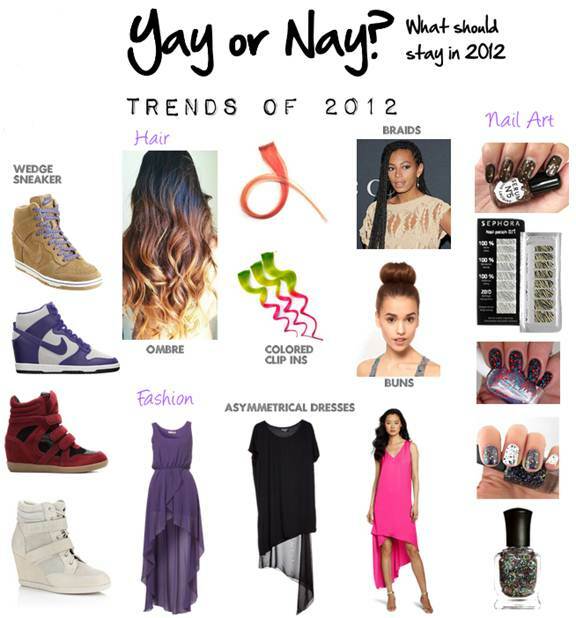 I fell in love with a lot of these trends for 2013. Which were your favorite? Which do you want to get rid of in 2013? Comment. 6 comments on "FASHION TRENDS OF 2012: YAY OR NAY?" I appreciated the braids, the wedge sneakers,the ombre, nail art, and the assymetrical dresses. I loved them all! Can't wait to see what 2013 brings. Yeah I'm not a fan of the braids either. Sometimes they look good on some people but I'd never personally get them. Hi, Happy New Year! Would you please consider adding a link to my website on your page. Please email me back. Well, I love nail art and buns. I never could pull off those dresses though. Good list of the trends.